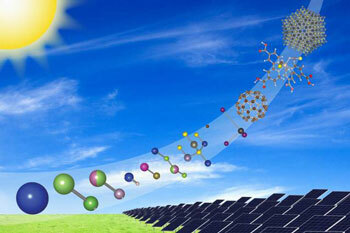 Photovoltaics | Genesis Nanotechnology, Inc. The University Institute for Advanced Materials Research at the Universitat Jaume I (UJI) has participated in the European Project Sunflower, whose objective has been the development of organic photovoltaic materials less toxic and viable for industrial production. A consortium of 17 research and business institutions has carried out this European project in the field of nanotechnology for four years and with an overall budget of 14.2 million euros, with funding of 10.1 million euros from the Seventh Framework Programme of the European Commission. Researchers at Sunflower have carried out several studies, among the most successful of which there are the design of an organic photovoltaic cell that can be printed and, consequently, has great versatility. In short, “we can assure that, thanks to these works, progress has been made in the achievement of solar cells with a good performance, low cost and very interesting architectural characteristics”, states the director of the University Institute for Advanced Materials Research (INAM) Juan Bisquert. The goals of Sunflower were very ambitious, according to Antonio Guerrero, researcher at the Department of Physics integrated in the INAM, since it was intended “not only to improve the stability and efficiency of the photovoltaic materials, but also to reduce their costs of production”. In fact, according to Guerrero, “the processes for making the leap from the laboratory to the industrial scale have been improved because, among others, non-halogenated solvents have been used that are compatible with industrial production methods and that considerably reduce the toxic loading of halogenates”. “The involvement of our institute in these projects has a great interest because one of our priority lines of research is the new materials to develop renewable energies,” says Bisquert, who is also professor of Applied Physics. In addition, these consortia involve the work of academia and industry. According to the researcher, “the transfer of knowledge to society is favoured and, in this case, we demonstrate that organic materials investigated for twenty years are already close to become viable technologies”. The participation of UJI researchers at Sunflower has focused on “improving the aspect of chemical reactivity of materials or structural compatibility”, says Germà García, professor of Applied Physics and member of INAM. “We have worked to move from the concepts of inorganic electronics to photovoltaic cells to the part of organic electronics,” he adds. The researchers wanted to take advantage of the faculties of absorption and conduction of plastic materials and to verify its capacity of solar production, an unusual use because normally they are used as an electrical insulation. At UJI laboratories, they have studied the organic materials, very complex devices because they have up to eight nanometric layers. “We have made advanced electrical measurements to see where the energy losses were and thus to inform producers of materials and devices in order to improve the stability and efficiency of solar cells,” explains Guerrero. “The potential applications of organic photovoltaic technology (OPV) are numerous, ranging from mobile consumer electronics to architecture,” says the project coordinator Giovanni Nisato, from the Swiss Centre for Electronics and Microtechnology (CSEM). “Thanks to the results we have obtained, printed organic photovoltaics will become part of our daily lives, and will allow us to use renewable energy and respect the environment with a positive impact on our quality of life,” according to Nisato. The European Sunflower project has been developed over 48 months with the main objective of extending the life and cost-efficiency of organic photovoltaic technology through better process control and understanding of materials. In addition, in the opinion of those responsible, the results of this research could double the share of renewable energy in its energy matrix, from 14% in 2012 to 27-30% by 2030. In fact, Sunflower has facilitated a significant increase in the use of solar energy incorporated in everyday objects. The Sunflower consortium consists of 17 partners from across Europe: CSEM (Switzerland), DuPont Teijin Films UK Ltd (UK), Amcor Flexibles Kreuzlingen AG (Switzerland), Agfa-Gevaert NV (Belgium), Fluxim AG (Switzerland), University of Antwerp (Belgium), SAES Getters SpA (Italy), Consiglio Nazionale delle Ricerche-ISMN-Bologna (Italy), Hochschule für Life Sciences FHNW (Switzerland), Chalmers Tekniska Hoegskola AB (Sweden), Fraunhofer Institut der angewandten Forschung zur Foerderung @EV (Germany), Linköpings Universitet (Sweden), Universitat Jaume I (Spain), Genes’Ink (France), National Centre for Scientific Research (France), Belectric OPV GmbH (Germany) and Merck KGaA (Germany). Meanwhile, the main lines of research at the INAM focus on new types of materials for clean energy devices, solar cells based on low cost compounds, such as perovskite and other organic compounds. Furthermore, INAM studies the production of fuels from sunlight, breaking water molecules and producing hydrogen and other catalytic materials in the chemical aspect, all of great importance in the context of international research. (From R & D Magazine) Use of solar photovoltaics has been growing at a phenomenal rate: Worldwide installed capacity has seen sustained growth averaging 43% per year since 2000. To evaluate the prospects for sustaining such growth, the MIT researchers look at possible constraints on materials availability, and propose a system for evaluating the many competing approaches to improved solar-cell performance. The analysis is presented in Energy & Environmental Science; a broader analysis of solar technology, economics and policy will be incorporated in a forthcoming assessment of the future of solar energy by the MIT Energy Initiative. The team comprised MIT professors Vladimir Bulović, Tonio Buonassisi and Robert Jaffe, and graduate students Joel Jean and Patrick Brown. One useful factor in making meaningful comparisons among new photovoltaic technologies, they conclude, is the complexity of the light-absorbing material. The report divides the many technologies under development into three broad classes: wafer-based cells, which include traditional crystalline silicon, as well as alternatives such as gallium arsenide; commercial thin-film cells, including cadmium telluride and amorphous silicon; and emerging thin-film technologies, which include perovskites, organic materials, dye-sensitized solar cells and quantum dots. Illustration shows the MIT team’s proposed scheme for comparing different photovoltaic materials, based on the complexity of their basic molecular structure. The complexity increases from the simplest material, pure silicon (single atom, lower left), to the most complex material currently being studied for potential solar cells, quantum dots (molecular structure at top right). Materials shown in between include gallium aresenide, perovskite and dye-sensitized solar cells. Image courtesy of the researchers. With the recent evolution of solar technology, says Jean, the paper’s lead author, it’s important to have a uniform framework for assessment. It may be time, he says, to re-examine the traditional classification of these technologies, generally into three areas: silicon wafer-based cells, thin-film cells and “exotic” technologies with high theoretical efficiencies. Under this scheme, traditional silicon—a single-element crystalline material—is the simplest material. While crystalline silicon is a mature technology with advantages including high efficiency, proven reliability and no material scarcity constraints, it also has inherent limitations: Silicon is not especially efficient at absorbing light, and solar panels based on silicon cells tend to be rigid and heavy. At the other end of the spectrum are perovskites, organics and colloidal quantum dots, which are “highly complex materials, but can be much simpler to process,” Jean says. “We’ve looked at a number of key metrics for different applications,” Jean says. “We don’t want to rule out any of the technologies,” he says—but by providing a unified framework for comparison, he says, the researchers hope to make it easier for people to make decisions about the best technologies for a given application.